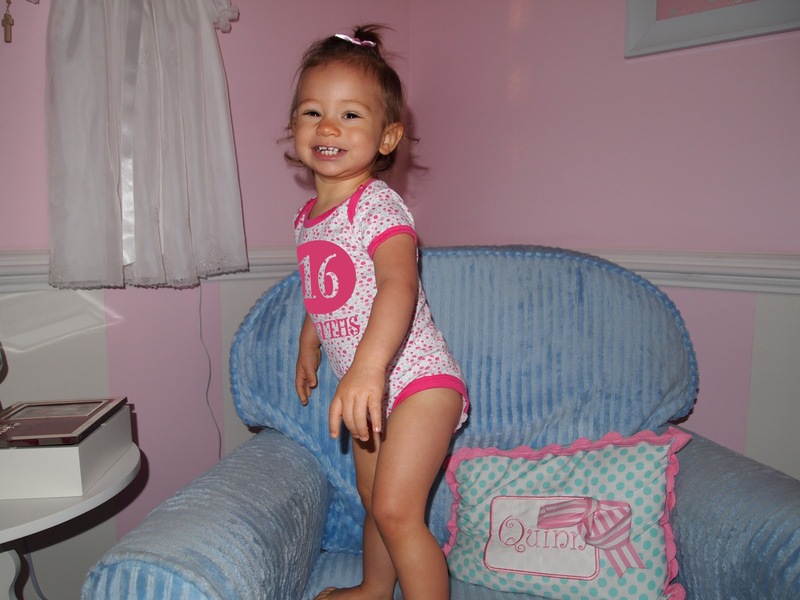 Yup, my little nugget is 16 months old. I honestly get depressed thinking about it. While she is SO MUCH FUN these days, she is also very challenging. This little girl has a personality like no other. She talks up a storm, she knows what she wants, she finally drinks all the whole milk she is supposed to and she has even started eating with a fork. Everytime she does something new it makes me think of that tiny little baby who was always content with me holding her and breastfeeding her. Now I am lucky if I can get a cuddle without being b*$ch slapped in the face. Just kidding. She only does that when I really annoy her. She actually has been very cuddly lately, which I take advantage of whenever I can. She will give kisses out of nowhere and she loves our "family hugs". Such a doll, that girl. Happy 16 months little girl. We love you more than you know. Especially Daddy who has no self control and brought you back this when we sent him out for paper towels and dog food.